I would say these condoms are razor thin, but it seems they are thinner than that. As CondomSizes.org explains, the average thickness of human hair is 0.06 millimeters. At 0.01 millimeters, these Japanese condoms are the thinnest in the world. According to website ZakZak, it took Sagami Rubber Industries over ten years to realize these rubbers, from conception to completion. In total, over 20,000 condoms were put through a battery of tests (probably water leakage tests, burst tests, and tensile tests as well as, I'm guessing, other tests) in a trial and error process. Sounds like Sagami wasn't screwing around! Sagami is Japan's first condom manufacturer and the first one in the world to create a color condom. It previously released a 0.02 millimeter condom in 2005. By comparison, the thinnest Trojan condom, the Trojan Ultra Thin, is around 0.06mm. 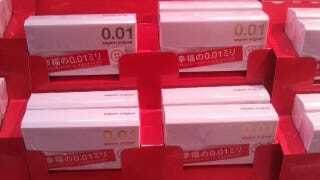 Two weeks ago, Sagami launched the polyurethane contraceptives in Tokyo, with a box of five costing 1,260 yen (US$12). ZakZak reports that the rubbers have been incredibly popular, with some shops apparently selling out their stock. "Honestly, I don't how we can make them thinner than this," a Sagami researcher told Tokyo Sports, "but as long as there is a need for thinner, we will continue researching 0.009 millimeter and 0.008 millimeter thinness."